Arrow Cross Cabin is a newly remodeled log cabin secluded in the cottonwoods located on a working ranch in the East Pioneers Mountains. There is a private road to the cabin and excellent view of 5 Southwest Montana mountain ranges. They are the Rubys, Highlands, Blacktails, East Pioneers and McCartney Mountains. Eight mountain lakes are located within 15 miles of the cabin that make for great fly fishing, hunting and hiking. Arrow Cross Cabins are a stone throw away from the Big Hole River, which is one of Montana's finest blue ribbon trout streams. 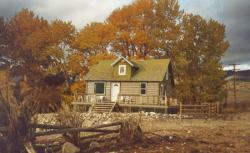 We are located 20 miles from the famous Beaverrhead River. Wildlife in the area includes elk, whitetail and mule deer, moose, ducks and geese The Arrow Cross Cabins are just off the Lewis and Clark Trail. Arrow Cross Cabin is fully furnished. It has two bedrooms downstairs The big bedroom has a king size bed, plus two twin beds and the smaller bedroom contains a full size bed. The cabin also includes a queen size hide-away couch, a full size bathroom, a fully furnished kitchen (stove, microwave, refrigerator and dishwasher), washer & dryer, satellite TV and CD player. The deck, overlooking the Big Hole Valley, has a propane BBQ. Shuttle service is available. We make your stay feel like home - Montana style! Directions: Arrow Cross Cabin is located 40 miles south of Butte or 20 miles north of Dillon. Using the Glen Exit #85 on I-15 the cabin is secluded in the trees just below the base of the East Pioneers Mountains. We are located on a working ranch close the the Big Hole River and mountain lakes.